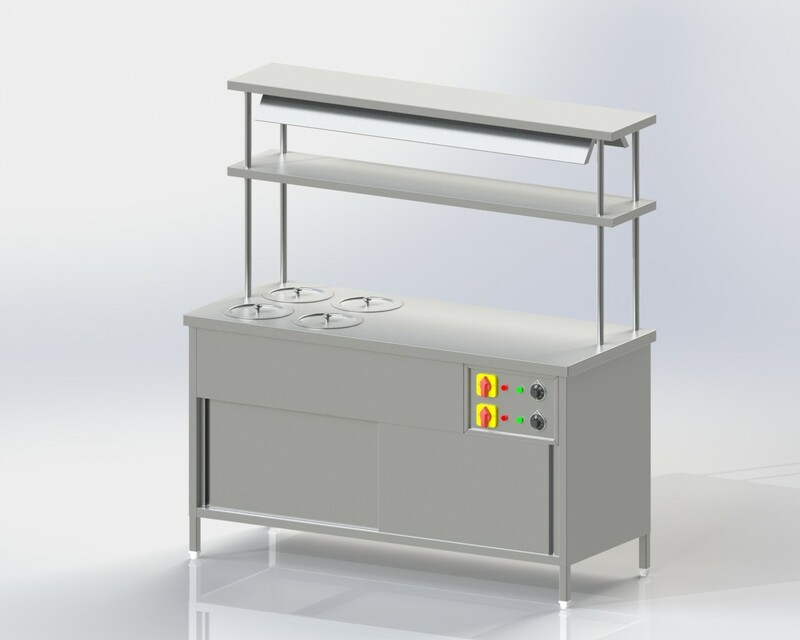 Heavy duty, 16 gauge type SS 304 Top Provide with 4 Hot Round Vessel Bain Marie. Top secured to TIG welded 35x35x5mm thick M.S Angle Framework. SS trough for Hot Bain Marie made from SS-304 18 gauge with Ball Valve releasing wastage water. Below the Top provide hot case with insulation and Three Side covering made from 18 gauges SS-304 also front side providing sliding doors made from 16 gauges SS-304. For Heating Purpose Providing Electrical Heater in Water Tank and also in Hot case. Front Side provide control panel with Thermostatic Temperature controller and ON/ OFF Switch. 4 Nos. Legs are 16 Gauge SS 304 30x30x1.5 SQ. Pipe.